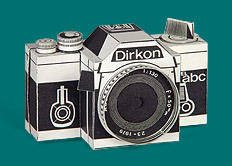 The Dirkon paper camera with its Dirkkor pinhole lens. Open back of camera with loaded film. During the 1970s, magazines published in Communist Czechoslovakia were controlled by the state, like the majority of other enterprises. Very few good magazines were available and were difficult to get hold of, so people would borrow and exchange them when given the opportunity. This also applied to magazines aimed at young people, which was probably one of the reasons why almost everyone from my generation, when we get on to the subject of pinhole cameras, has fond memories of the cut-out paper camera known as Dirkon*, published in 1979 in the magazine ABC mladých techniků a přírodovědců [An ABC of Young Technicians and Natural Scientists]. 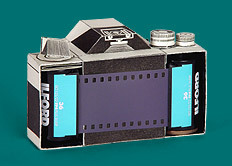 Its creators, Martin Pilný, Mirek Kolář and Richard Vyškovský, came up with a functional pinhole camera made of stiff paper, designed for 35 mm film, which resembles a real camera. It may not be the most practical of devices, but it works! My first attempt at putting together a paper Dirkon a few years after it came out fell victim to a total lack of patience on my part. Today, twenty years later, I decided that I had to include this unusual pinhole camera in my collection. So I got hold of an old copy of ABC and set to work. This time I was successful, and here are a few sample photographs: 1, 2, 3, 4, 5. * The name Dirkon is a play on words based on the combination of the parts of two words: Dirk- is the beginning of the Czech word dírka – pinhole, and -kon is the end of the name of a well-known Japanese camera which needs no introduction. For the patient among you, here are the instructions for making the Dirkon camera which you can download in Adobe PDF format. But first a few notes which I've jotted down after my experience with making it, which you might find useful. The camera must be cut out of stiffer paper than ordinary office paper (or thin card). If the paper isn't entirely opaque, you need to stick very thin black paper underneath the important sections so that no light gets into the camera. This is particularly important for sections 1, 2, 3, 10 and 23. It is very important to print the cut-out to the correct size, i.e. 1 : 1. When you are printing from the Acrobat Reader, the option "Fit to page" MUST NOT be selected, otherwise the pages might come out smaller and the film won't fit into the Dirkon camera. I've added a ruler on each page so that you can check that the size is correct. The instructions recommend using Foma 21° DIN film. This was film made back in former Czechoslovakia but it's similar, for example, to today's Ilford PAN 100. You can of course use any 35 mm film, even colour. I discovered from the makers of Dirkon that, even when it was published, people often came up with improvements on their model. The design was significantly improved by sticking on a thin piece of metal with a hole, rather than making the hole in the paper, as described in the instructions. I didn't follow this suggestion, however, since I wanted to experience the real magic of Dirkon photography. * Note: some Internet browsers, such as MS Internet Explorer, directly open the Adode Acrobat (PDF) file. If you want to download it you can click on the link using the right mouse button and select "Save target as...".